Below are some tips for how to remove mustard stain from clothing and carpet using home remedies. There are two interrelated reasons that there are so many methods discussed for removing these stains. First, these stains can be difficult to remove in general, so you may need to try several methods before you find something that works for you. In addition, the method for removal is somewhat dependent on what type of mustard you're dealing with. Some mustards are more oily while some have lots of mustard seed or other spices, which are tannin stains. This means that these stains are "combination" stains, and you've got to take several steps, sometimes, to get all parts of the stain removed. Therefore, the methods below are meant as general tips you can try. Always use the most conservative methods first, and try only the harsher cleaning solutions if the gentler ones don't do the trick for you. Further, for clothing it may take a couple of attempts to remove the spots, plus a couple of washings. Make sure you don't dry the clothing after one washing unless the stain is completely removed, or you may set it making complete removal even more difficult. Finally, since there are so many methods for how to remove a mustard stain, you may know of an additional method not mentioned below. If so, I'd love it if you'd share your tips for removing these stains here, or read other tips already submitted by others. Join in and write your own page! It's easy to do. How? Simply click here to return to mustard stains. The video below shows how to remove mustard stain from clothing. I like that in the video it differentiates between fresh stains, old stains, and stubborn stains and gives ideas for how to get rid of all of them. If the stain is old, the video suggests first pretreating with glycerin, and letting this sit on the fabric for approximately 30 minutes. This will help loosen the stain before proceeding with the other stain removal techniques. 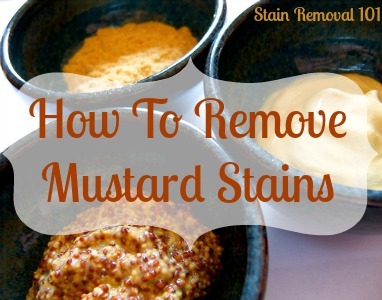 The video then suggests several progressive steps to take for removing mustard stains. First, try pretreating with a solution of dishwashing liquid and lukewarm water, and then wash the garment in the hottest water allowed for the fabric. 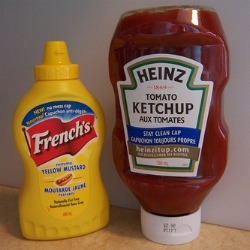 If that does not work completely you have a stubborn mustard stain. There are additional videos below that give even more tips. The video below gives tips for removing these spots from washable fabrics. 1. 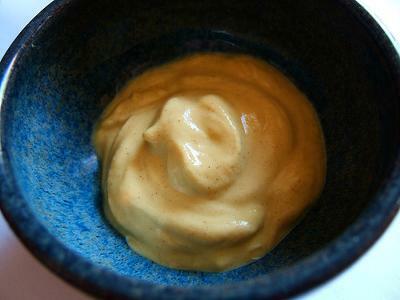 Removing excess mustard from the fabric with a paper towel or clean white cloth. 2. Creating a solution of water and laundry detergent and blotting this onto the spot. 3. Then pretreating the stain with either a laundry stain remover or with rubbing alcohol, and letting this sit for 15 minutes. 4. Wash as usual, and make sure the stain is removed before placing in the dryer. Repeat as necessary. An additional really good video that gives tips for how to remove these spots from clothing is one from Martha Stewart. You can watch Martha Stewart's tips here. Plus, below there's a video for how to remove these stains from your carpet. The video below gives tips for how to remove mustard stain (along with ketchup stain) from carpet. There are things I like about this video, and things I don't. The video suggests first scraping off any excess mustard or ketchup from the carpet, so you don't spread the stain further. Then, blot up any additional excess with a paper towel. Finally, it suggests to create a cleaning solution of dish soap and water to use to blot at the stain. These parts of the video are what I like. However, I think he leaves out a critical last step, which is after using the dish soap cleaning solution you need to blot with cold water to try to remove as much excess soap residue from the carpet as possible. If you don't do this that area of your carpet will begin to attract even more dirt from the soap left in the carpet fibers and will eventually look even dirtier than before, just not with mustard or ketchup stains anymore. In addition, you only want to get your carpet as wet as necessary to remove the stain, and may need to use a fan to get it completely dry. You may also want to wick up excess moisture from the carpet by laying something absorbent on the wet spot, and then laying something heavy on top of that. You definitely want to make sure the carpet dries completely to prevent mold or mildew from growing in the damp spot. So, here's the video about how to remove ketchup and mustard stains from carpet. 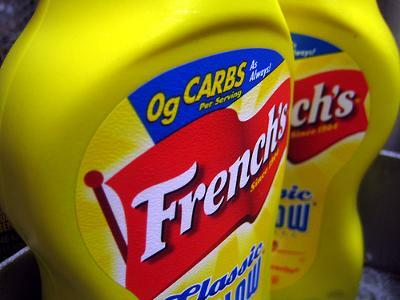 As you can see there are lots of methods for trying to remove mustard stain from surfaces in your home. In fact, here's my guide to removing them from clothes, upholstery and carpet in case you want even more suggestions. If you've got even more tips or home remedies to share that have worked for you I'd love to hear them. You can share your tips here, or read others that have already been submitted.